A complete office solution for all your labeling and printing needs including labels, barcodes, photo ID cards, and more. Print Studio provides a wide variety of powerful, yet easy to use tools such as shapes, gradient, artistic text, layers and blending, watermark effect, and more. Whether you are looking for addressing label software, a photo ID card designer, a professional barcode labeler, or an artistic CD label maker; this one program currently includes everything you need. Print Studio includes more than 2500 predefined templates for industry standard labels including templates for CD/DVD, badges and most Avery products. 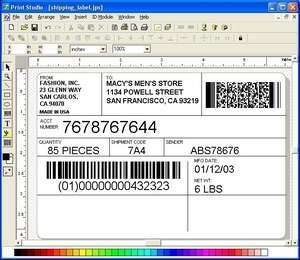 Print Studio Label Maker 6.7 is a shareware program and can be used as a demo to try the software until the free trial period has ended. A full version of the program is available after the trial period ends. For security reasons, you should also check out the Print Studio Label Maker download at LO4D.com which includes virus and malware tests. Additional screenshots of this application download may be available, too.